With a comfortable and supportive high back combined with a charming design, the elegant Amish Harvest Highback Dining Chair lends itself easily to a french country furniture collection. With gracefully curved back legs and wide horizontal slats, this solid wood dining chair brings warmth to your dining room gatherings. This Harvest Highback Dining Chair is shown in solid oak wood that provides a strong and durable wood to support daily use. 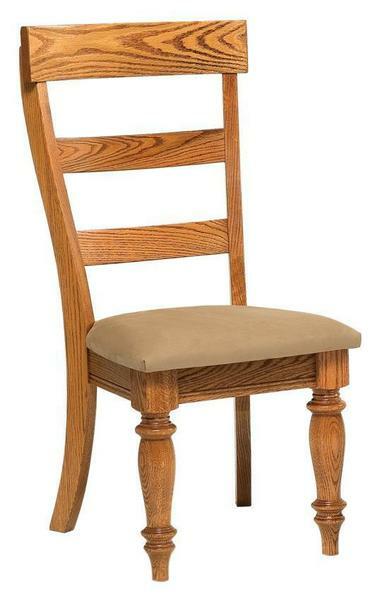 These dining room chairs are handcrafted by skilled Amish craftsmen here in America. Combining premium quality hardwoods with woodworkers who have years of experience, your Amish dining chairs are sure to serve your family for generations to come. Enjoy the customizations that come with Amish made furnishings. Select from ten different wood species for your custom made dining chairs as well as one of four different leg style options. View the Amish Harvest Dining Bench for another solid wood seating option in your dining room. For a complete guide to selecting solid wood dining chairs that are perfect for your home, visit our helpful blog post, DutchCrafters Ultimate Guide to Choosing the Perfect Dining Room Chair. Please call us today, toll-free at 866-272-6773 with any questions regarding our Amish dining room furniture. Shown in Oak with FC-5591 Golden Honey Stain.